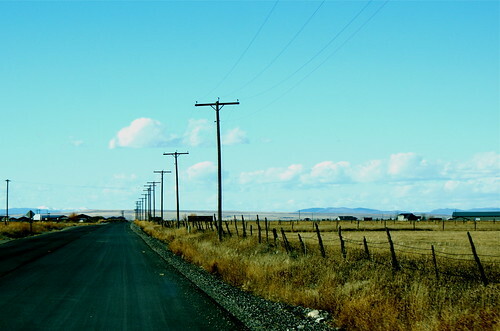 FUCheese » Amaltheia Dairy, Montana! What? I can’t quite hear you. Did you say, “more goats”? I aim to please…. 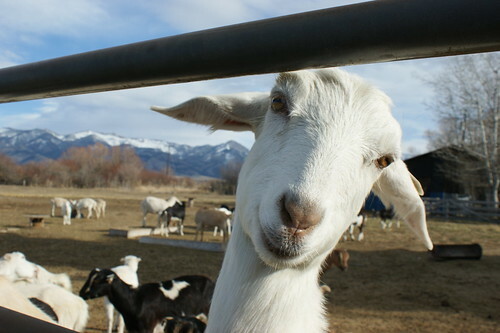 Don’t you think goats have Mona Lisa smiles? I was out in Bozeman visiting my family and the first thing I did when I got into town was stop in the local Food Co-op and scope out the cheese selection. I bought a bunch of good stuff to share (Humboldt Fog which my brothers loved, a puck of French Prairie brie from Willamette Valley and some dependable 12-month manchego). Then I hunted around for something from Montana. The only thing I could find was the mysteriously named Montana Organic Chevre. After we feasted on all this good cheese and decided that the chevre was truly awesome, I started poking around online to figure out who was behind this yummy chevre. As it turns out, right outside Bozeman, Montana, in the cute little town of Belgrade, you can find one of Montana’s few cheesemakers. I sent them an email asking for a tour and heard back almost immediately that I could come on out. Montana Organic Chevre is produced by Amaltheia Dairy, a family operation owned by Sue and Melvyn Brown with cheese and pigs tended by their son, Nate. From the feed, to the methods, to the product, it’s all organic. Sue and Melvyn own 20 acres and lease another 350 for their herd of goats and pigs. They raise the pigs for their meat which is cured without nitrates by another local business and sold in town. The pigs, of course, get to feast on the delicious and nutritious whey which is a bi-product of the cheesemaking operation. I convinced my Mom that she needed to come with me to see all the goats plus I would need her help to keep from getting lost. First we stopped off at the creamery which is right on the main drag through Belgrade. It’s a non-descript, no frills operation where they convert over 1,000 gallons of fresh goat milk per week into organic chevre (plain, garlic and chive, spicy pepper and other tasty flavors), plus feta and ricotta. Sadly, they are not yet doing any aging yet – I was hoping to score something good and stinky on my visit. Then we drove over to the farm about five miles away and met Melvyn, a Brit with a career background in animal husbandry. He met Sue in Guatemala and eventually they made their way to Montana to pursue organic farming as a living. Melvyn showed us around the farm and introduced us to some goats and a very friendly piggie named Wilbur. They are an all-goat, all-chevre creamery and maintain over 250 milking goats: LaMancha, Alpine & Saanen. They farm their own feed and compost their manure and farm waste. In fact, they are part of a Montana pilot program to make this kind of compost and waste recovery more prevalent and revenue-generating. We talked a little bit about the ups and downs of being a cheesemaker in Montana and how difficult it is to assure all the regulatory agencies that your milk is safe. Melvyn knows of only one other cheesemaker in the state, a fellow doing cow’s milk cheese commercially in western Montana. 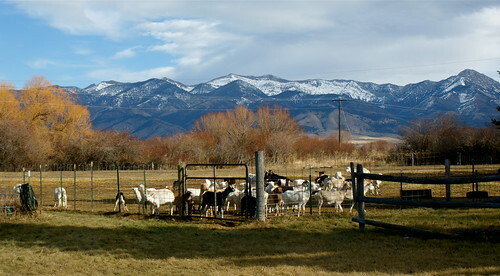 Goat pasture with the Bridger Range in the background. You can find their cheese primarily in Montana, Wyoming and Idaho. Sadly, I couldn’t find it around the Portland area. You can learn more about them on their website or their Facebook page. You can also buy fantastic packages of their cheeses – a great gift idea for a chevre lover. See more photos of the dairy (and goats! and pigs!) on my Flickr photostream. A big thank you to the folks at Amaltheia for letting me come out and a special thanks to Melvyn for being my tour guide. Best of luck to you! Thanks for the clarification, Sue! Everyone — ask for Montana Organic Chevre from Amaltheia Dairy by name! It’s delicious and organic. in Lakeview, mi., where they have always bought there cheddar cheese there favorite has always been the Sharp & extra sharp. I drank goats milk years ago and it is good, have had the goat cheese. Tried getting my parents just to try it but you know how hard it is to change someone set in there ways. My parents just had there 70th wedding aniversity on Sept., 21st. Wonderful article! 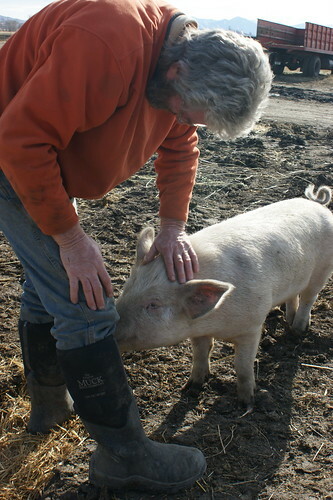 Will be visiting family on Friday-Monday…hope we can come meet Wilbur, and visit the farm. My sister in law lives down the street from Belgrade, her daughter is getting married, I’m sure she would love some Chevre’! !